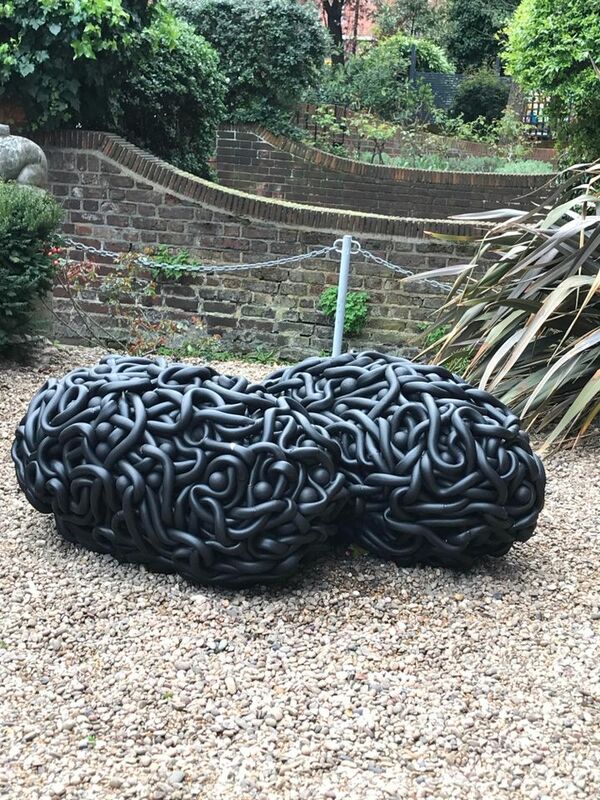 The established UK sculptor Alison Wilding initially wanted to install a work on the balcony of the Royal Society of Sculptors (RSS) building when she was asked to show works at the South Kensington venue (What isn’t here can’t hurt you, until 3 May). But siting a work on the upper level of the Society headquarters, known as Dora House, was not an option. “I wanted to put a work on the balcony but it is too precarious,” Wilding says (fundraising for a refurbishment of the elegant property is underway). The artist says she “had to think on her feet”, and plumped instead to place a piece on the terrace below. The result is Let sleeping dogs…. (2019), a swirl of tubed forms bunched into two balls that can just be seen by curious passers-by who care to peek over the hedge (or to be more accurate, the work comprises 345 metres of pipe lagging and 250 metres of aluminium wire around two ceramic planters). Inside, Wilding’s other work, Inversion (2000), fills one of the gallery spaces. 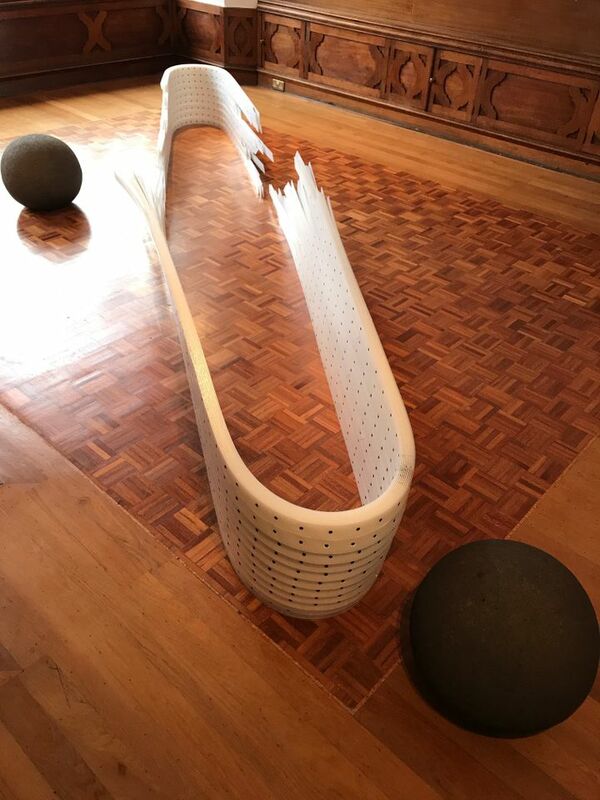 The piece consists of two oak slabs connected by a circular copper vessel which seems to balance across the two huge wooden pieces, reflecting the dexterity and daring of Wilding whose innovations are often overlooked (Charles Saumarez-Smith, the former chief executive of the Royal Academy of Arts, notes on his blog that the work, drawn from the Arts Council collection, is “looking good”). The show is a dialogue between Wilding and Leeds-born Frances Richardson who is showing Because the two parts don’t quite touch (2019)—a looped structure surrounded by a pair of boulders—among other works. Asked if her works dovetail with Wilding's, she says: "I’m not sure that I consider the works to be in a 'dovetail' relationship. Perhaps I'm thinking too visually about the metaphor but the expression implies an expectation is for things to fit neatly into one another. I'm not sure that they do. Logical relationships—'making sense'—is perhaps something that we both instinctually resist within our practices, so why impose it on an exhibition?" But there are links. "A connection I feel that the work has is that the materials are very present, edges, surfaces, mass, volume, space, light, shadows. Also, I think the encounter is something that both Alison and I are sensitive to," Richardson adds.